Laiz Rodrigues, president of the Central Florida Brazilian American Chamber of Commerce presents a special award to Mayor Teresa Jacobs to recognize Orange County’s partnership with Brazil. 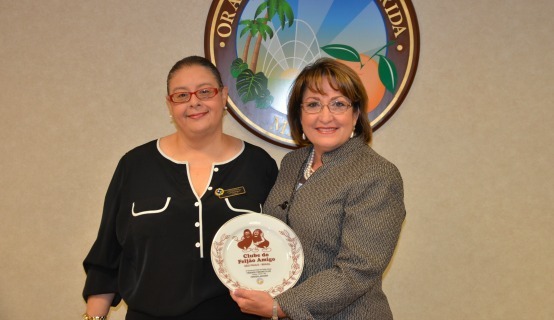 The Central Florida Brazilian American Chamber of Commerce recently presented Orange County Mayor Teresa Jacobs with a special award from FENACTUR, the Brazilian National Federation of Tourism, recognizing Orange County’s dynamic economic partnership with Brazil. FENACTUR represents more than 1,000 travel agencies in Brazil and was founded to serve its members and market the tourism industry both domestically and internationally. Brazil is one of Central Florida’s top international visitor countries, with approximately 770,000 guests visiting from the region in 2013. Laiz Rodrigues, president of the Central Florida Brazilian American Chamber of Commerce, presented the award to Mayor Jacobs to recognize the importance of the relationship between Orange County and Brazil. According to the U.S. National Travel and Tourism Office, Brazil was one of the top 20 tourist generating countries in the United States in 2014. Visitation from the country jumped by almost 10 percent last year and it now sends more visitors to the U.S. than Germany, France and India. Visit Orlando is also a key partner in promoting our international tourism industry. By providing an expanded focus on Brazil and with representation in the country to strengthen partnerships with tour operators, airlines, advertising, public relations and promotions initiatives, Visit Orlando has enhanced and encouraged the growth of Brazilian tourism in Orange County. Previous Post GRAMMY AWARD-WINNER, RICKY MARTIN BRINGS HIS ONE WORLD TOUR TO AMWAY CENTER ON OCT 25 / TICKETS ON SALE FEB 20 AT 10 A.M.